Weed, pot, ganja, dope, mary jane, reefer, skunk, and chronic—they all refer to marijuana, that illicit substance used by so many, yet illegal across most of the civilized world. Despite the ‘war on drugs,’ pot smokers continue to light up in Australia, Canada, the United Kingdom, the United States, and even India. Hinduism has long been associated with pot. Since approximately 1500 BC, in fact, Hindu worshipers have been consuming pot—whether smoking it through a chillum [clay pipe] or drinking bhang, a mixture consisting of the pot mixed with milk, spice, and sugar—in the hope of achieving a higher spiritual level. Consider Bangalore’s Chitradurga district in Karnataka state, southern India. It’s a hilly region lined with dilapidated fortresses from times of antiquity; modern-day schools, colleges, and libraries; and many temples, one of which is notorious for its pot-smoking Hindu inhabitants. 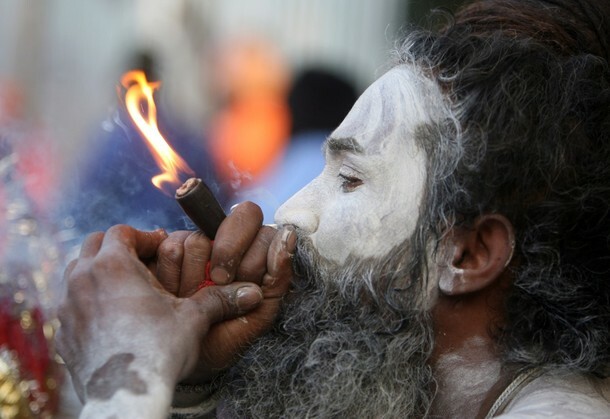 According to Jaipal Sharma from Asian News International, every March the temple’s devotees smoke pot in celebration of their diety Nayakana Hatti Tipperudraswami, whom they claim is the incarnation of Hindu God Lord Shiva. He says that the tradition has been occurring for over 800 years. “He (Tipperudraswami) attained Moksha (salvation) at this place,” a member of the temple committee told Sharma. And so the devotees believe that by smoking pot, they can follow in Tipperuddaswami’s path and also attain salvation. What’s interesting, however, is that the temple devotees refuse to share their pot, a trait quite unusual since most pot smokers love to share their stash with anybody willing to participate. Good luck with that mission, Mr. Scrooge!